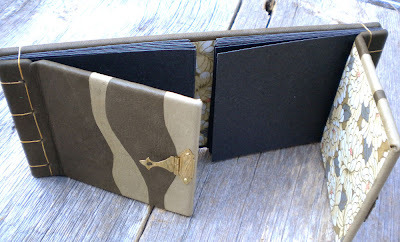 This two-sided album was made for the book swap by Rhonda of MyHandboundBooks. This book opens in two directions, bound on each end using the classic Japanese yotsume toji 4-hole stab binding. There are black card stock pages and it is lined on the inside with Japanese paper. On the outside, there are two colours of soft sheepskin leather inlaid on the covers and a little brass hasp in the centre. 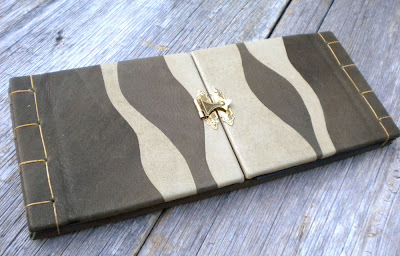 Check out MyHandboundBooks.Etsy.com for more of Rhonda's books. i got this one. very nice. the leather feels so smooth!